As OKCTalk was first to report, plans are well underway to bring a huge Amazon fulfillment center to an area just to the east of Will Rogers World Airport. Building blueprints have already been drawn for the facility and OKCTalk has obtained them along with details of how it will operate. The Oklahoma City fulfillment center at SW 89th and Portland will be one of the first built from the ground-up with the express purpose of utilizing their new Robotics Service Platform, a layout that maximizes the benefits of thousands of small robots. The footprint of the warehouse will be 640,000 square feet with three upper levels, bringing the total size of the facility to a staggering 2.5 million square feet. To put that 2.5 million number in perspective, the largest building at OKC's GM Assembly Plant was 2 million square feet and the entire complex was 3.8 million square feet. The ground floor will facilitate material handling and sorting equipment. The upper floors will house a large automated storage system with shelf-like storage units (“pods” in the parlance of Amazon) that are stocked with millions of consumer products. When an order is placed through Amazon.com, it is transmitted to the fulfillment facility. 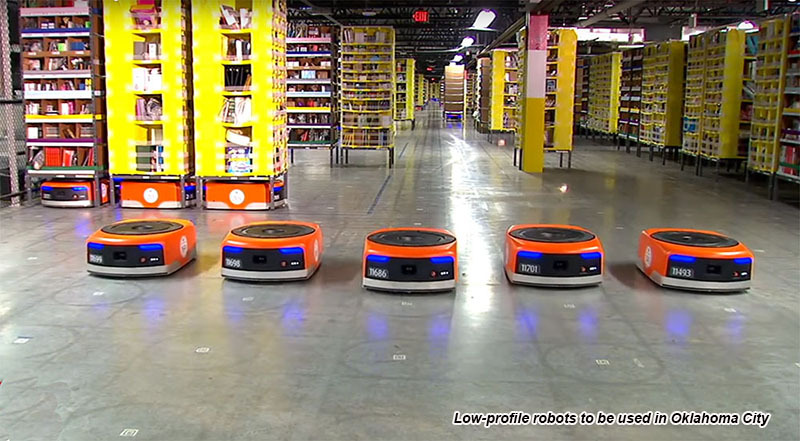 Then, the low-profile robots are automatically dispatched to retrieve the pods holding the requested items and delivered to workers at the perimeters of the upper floors where they are placed in a tote and conveyed to the ground floor where sorting, combining, packaging and shipping occurs. Once the items have been pulled by workers, the robot returns the pod to a storage location in the field. The 'RSP Clear Zone' shown on the top 3 floors of OKC's facility designates 'Robotic Service Platforms' where the small robots follow predetermined markings on the floors, using special sensors to avoid obstacles. Not only is the time to complete packaging an order greatly reduced by eliminating the need for workers to walk to item locations, but the facility itself will contain 50% more items in the same space. A typical Amazon fulfillment center stocks more than 20 million separate item types. As the first Amazon fulfillment center to be located in Oklahoma, local Amazon Prime members in particular can expect faster delivery on a greater variety of items, as now orders originate in other states. Amazon has retrofitted some of it's centers to accommodate the robots but OKC will see one of the very first built around a new prototype specifically designed to maximize efficiency. Based on documents reviewed by OKCTalk, the OKC facility plans are already being used for other in-progress Amazon fulfillment centers in other markets. 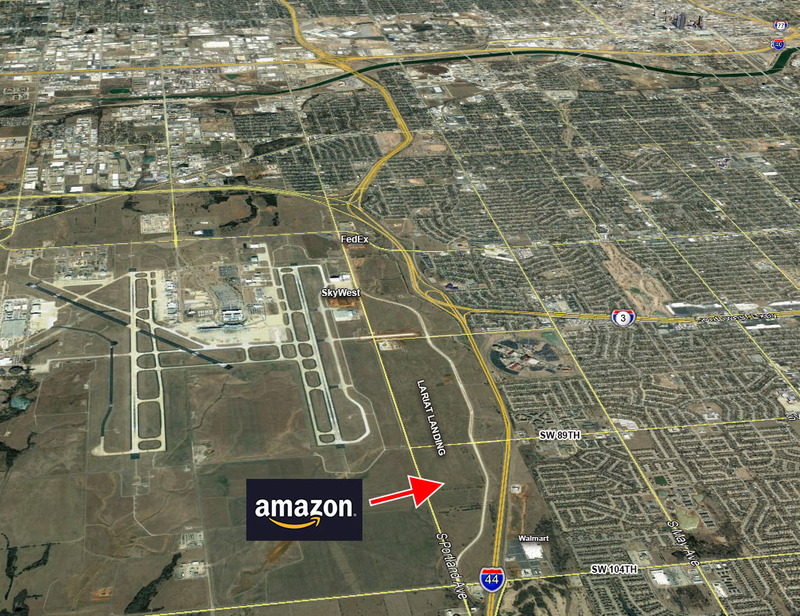 In addition to the new fulfillment center at SW 104th & Portland and the operating sortation facility at SW 15th & Council, Amazon has also submitted plans for a 60,000 square foot delivery station on the northeast corner of I-35 and Hefner Road, meaning Oklahoma City will soon be home to 3 of the most common links in their distribution chain thereby expediting the delivery of millions of items to customers in Central Oklahoma. 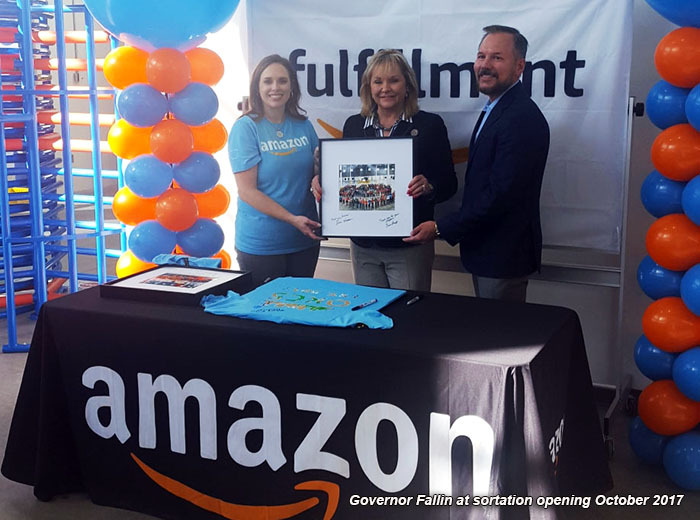 As the first physical presence by Amazon in the state of Oklahoma, a sortation facility opened at SW 15th & Council road on October 24th of last year. The 300,000 square foot warehouse receives packages from fulfillment centers and sorts them by zip code before placing them on pallets and delivering directly to the corresponding post offices. From there, the USPS preforms the final delivery to the customer, sometimes on Sunday through a unique agreement with the internet retailer. 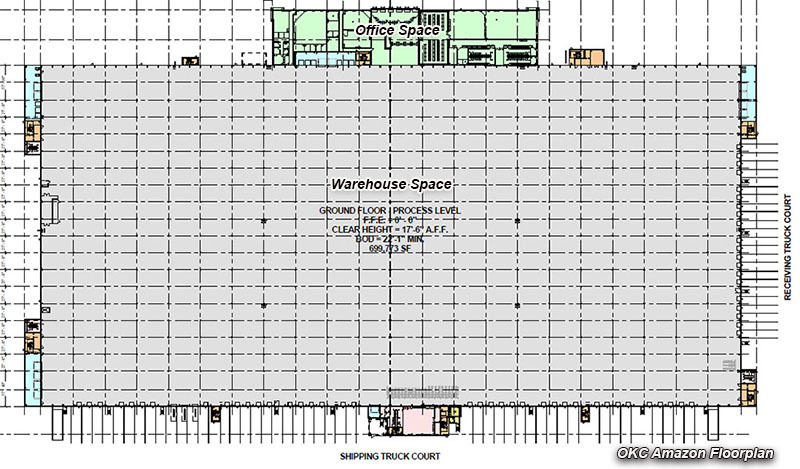 Sortation centers also ship packages to Amazon's extensive delivery station network. Delivery stations are smaller facilities typically found in larger urban areas and the primary role is to sort packages for outbound routes to enable last mile delivery within a tightly defined urban area. Often deliveries are performed by multiple local courier companies that are contracted by Amazon to service specific routes and also by independent Amazon Flex drivers. Although robots will eliminate a lot of the walking and retrieving typical in traditional warehouses, the new facilities still require a large workforce. The exact number to be employed in Oklahoma City has yet to be specified but a similar facility in the Denver area – also being designed for heavy robotic use – will soon be hiring 1,500 full-time 'associates' as Amazon calls its workers. Part-time seasonal workers will also likely be added as order flow dictates. The work is demanding and physical, with most of a shift being spent walking and standing with some lifting required. Pay varies by market and in areas closest to Oklahoma, hourly wages are typically $10.00 to $12.00 but includes healthcare benefits from day one, along with a 401(k) program, holiday and overtime pay, paid time off, maternity and paternal leave benefits, employee discounts and flexible work schedules which is particularly beneficial to those in school. The Amazon sortation facility in Oklahoma City is currently advertising part-time jobs at $10.25 per hour and quickly filled its 350 full-time positions through job fairs held last summer. Almost all of the 1,500 employees will work on the warehouse floor although a small amount of office workers -- approximately 50 to 75 based on similar facilities -- will receive higher pay. Typical office functions include training and human resources. 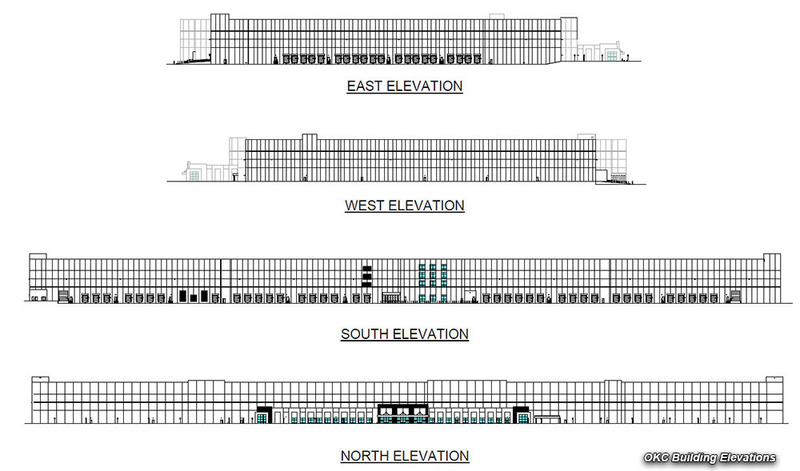 Plans show a total of 1,899 parking spaces and a maximum expected occupancy of 2,000. As has been well publicized, Amazon frequently seeks financial incentives and the Alliance for Economic Development – a nonprofit group that coordinates new development and employers while dispensing millions from various economic development programs – has been working with the company for months. The Oklahoma City Chamber of Commerce has also be aiding in the recruitment effort. The Alliance is not subject to open meetings and records laws and often uses code names for prospects in order to avoid public scrutiny. However, once a tentative agreement has been reached, it is most usually reviewed and approved by the Economic Development Trust then City Council has final authority. OKCTalk learned some time ago that the OKC Amazon fulfillment center was given the name 'Project Star' and that name has appeared on various public documents over the last several months. The amount of incentives being negotiated with Amazon is not known at this time but based on other markets, it is expected to be in the millions. According to various studies it is project that by 2021 Amazon will handle 50 percent of all on-line sales.